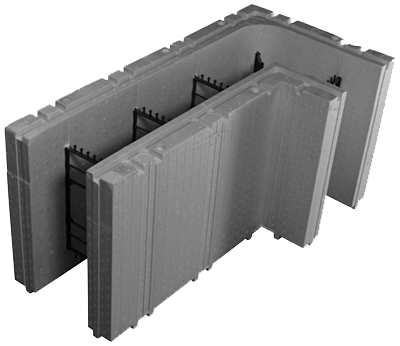 The 90 degree corner block typically makes up 10-15% of the Advantage ICF wall assembly on residential and commercial projects. Each corner block has 5 webs or ties that are molded into the block design for a strong, easy to install corner. With one side longer than the other, there are “right and left” corners. On a 6” Advantage ICF corner, one side is 32 inches long, and the other side is 16 inches long. As you stack the block in what is known as “courses,” you alternate your corners back and forth. This gives you the offset seam needed to create a strong wall. Each 6” 90 degree block is 16.5” high, 32" x 16" long, with a total overall thickness of 11.25”.